, earl of Warrington, and baron Delamer of Dunham Massey, an upright senator and distinguished patriot, was born on the 13th of January, 1651. He was the second son of the preceding George lord Delamer, by the lady Elizabeth Grey. In the life-time of his father, he was custos rotulorum for the county palatine of Chester, and also knight of the shire for that county, in several parliaments during the reign of king Charles ths Second. He very early rendered himself conspicuous by his zeal for the protestant religion, and the liberties of his | country. 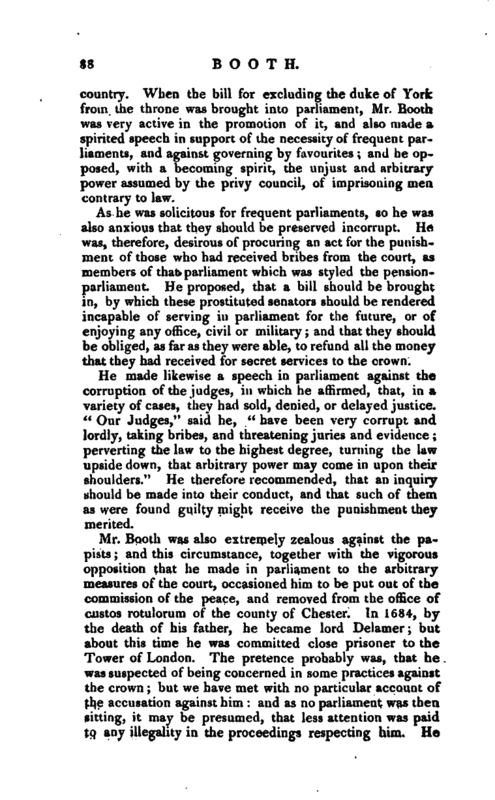 When the bill for excluding the duke of York from the throne was brought into parliament, Mr. Booth was very active in the promotion of it, and also made a spirited speech in support of the necessity of frequent parliaments, and against governing by favourites; and he opposed, with a becoming spirit, the unjust and arbitrary power assumed by the privy council, of imprisoning men contrary to law. As he was solicitous for frequent parliaments, so he was also anxious that they should be preserved incorrupt. He was, therefore, desirous of procuring an act for the punishment of those who had received bribes from the court, as members of that parliament which was styled the pensionparliament. He proposed, that a bill should be brought in, by which these prostituted senators should be rendered incapable of serving in parliament for the future, or of enjoying any office, civil or military; and that they should be obliged, as far as they were able, to refund all the money that they had received for secret services to the crown. He made likewise a speech in parliament against the corruption of the judges, in which he affirmed, that, in a variety of cases, they had sold, denied, or delayed justice. “Our Judges,” said he, “have been very corrupt and lordly, taking bribes, and threatening juries and evidence; perverting the law to the highest degree, turning the law upside down, that arbitrary power may come in upon their shoulders.” He therefore recommended, that an inquiry should be made into their conduct, and that such of them as were found guilty might receive the punishment they merited. 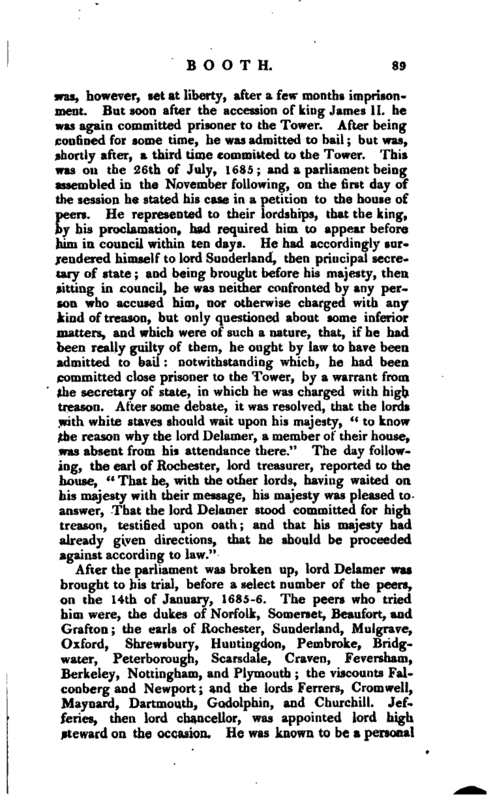 After the parliament was broken up, lord Delamer was brought to his trial, before a select number of the peers, on the 14th of January, 1685-6. The peers who tried him were, the dukes of Norfolk, Somerset, Beaufort, and Grafton the earls of Rochester, Sunderland, Mulgrave, Oxford, Shrewsbury, Huntingdon, Pembroke, Bridgwater, Peterborough, Scarsdale, Craven, Feversham, Berkeley, Nottingham, and Plymouth; the viscounts Falconberg and Newport; and the lords Ferrers, Cromwell, Maynard, Dartmouth, Godolphin, and Churchill. Jefferies, then lord chancellor, was appointed lord high steward on the occasion. He was known to be a personal | enemy of lord Delamer, who had arraigned in parliament the conduct of Jefferies as chief justice of Chester. 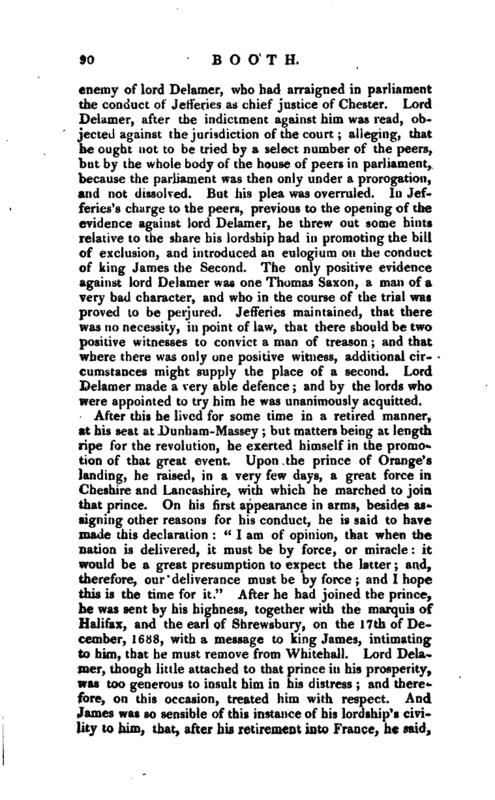 Lord Delamer, after the indictment against him was read, objected against the jurisdiction of the court; alleging, that he ought not to be tried by a select number of the peers, but by the whole body of the house of peers in parliament, because the parliament was then only under a prorogation, and not dissolved. But his plea was overruled. In Jefferies’s charge to the peers, previous to the opening of the evidence against lord Delamer, he threw out some hints relative to the share his lordship had in promoting the bill of exclusion, and introduced an eulogium on the conduct of king James the Second. The only positive evidence against lord Delamer was one Thomas Saxon, a man of a very bad character, and who in the course of the trial was proved to be perjured. Jefferies maintained, that there was no necessity, in point of law, that there should be two positive witnesses to convict a man of treason; and that where there was only one positive witness, additional circumstances might supply the place of a second. Lord Delamer made a very able defence; and by the lords who were appointed to try him he was unanimously acquitted. After this he lived for some time in a retired manner, at his seat at Dunham-Massey; but matters being at length ripe for the revolution, he exerted himself in the promotion of that great event. Upon the prince of Orange’s landing, he raised, in a very few days, a great force in Cheshire and Lancashire, with which he marched to join that prince. On his first appearance in arms, besides assigning other reasons for his conduct, he is said to have made this declaration: “I am of opinion, that when the nation is delivered, it must be by force, or miracle: it would be a great presumption to expect the latter; and, therefore, our deliverance must be by force; and I hope this is the time for it.” After he had joined the prince, he was sent by his highness, together with the marquis of Halifax, and the earl of Shrewsbury, on the 17th of December, 1688, with a message to king James, intimating to him, that he must remove from Whitehall. Lord Delamer, though little attached to that prince in his prosperity, was too generous to insult him in his distress; and therefore, on this occasion, treated him with respect. And James was so sensible of this instance of his lordship’s civility to him, that, after his retirement into France, he said, | that <c the lord Delamer, whom he had used ill, had then treated him with much more regard than the other two lords, to whom he had been kind, and from whom he might better have expected it." Lord Delamer, however, had no inclination that an accommodation should take place between king James and the nation. 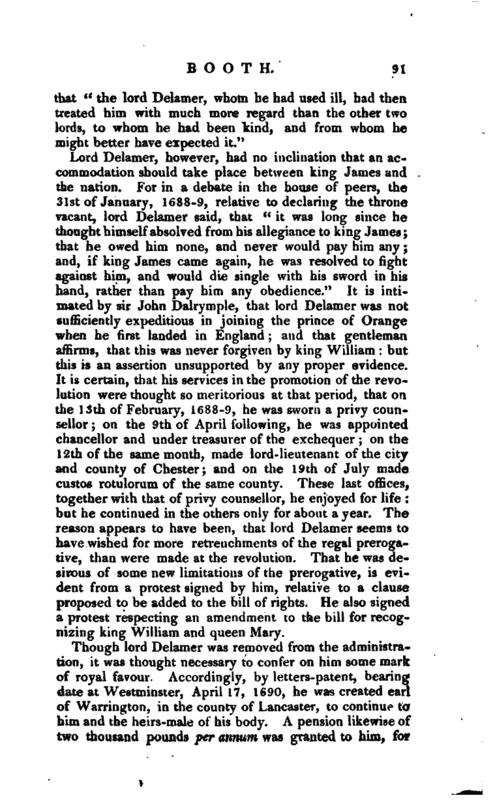 For in a debate in the house of peers, the 3 1st of January, 16S8-9, relative to declaring the throne vacant, lord Delamer said, that “it was long since he thought himself absolved from his allegiance to king James; that he owed him none, and never would pay him any; and, if king James came again, he was resolved to fight against him, and would die single with his sword in his hand, rather than pay him any obedience.” It is intimated by sir John Dalrymple, that lord Delamer was not sufficiently expeditious in joining the prince of Orange when he first landed in England; and that gentleman affirms, that this was never forgiven by king William: but this is an assertion unsupported by any proper evidence. It is certain, that his services in the promotion of the revolution were thought so meritorious at that period, that on the 13th of February, 1688-9, he was sworn a privy counsellor; on the 9th of April following, he was appointed chancellor and under treasurer of the exchequer; on the 12th of the same month, made lord-lieutenant of the city and county of Chester; and on the 19th of July made custos rotulorum of the same county. These last offices, together with that of privy counsellor, he enjoyed for life: but he continued in the others only for about a year. The reason appears to have been, that lord Delamer seems to have wished for more retrenchments of the regal prerogative, than were made at the revolution. That he was desirous of some new limitations of the prerogative, is evident from a protest signed by him, relative to a clause proposed to be added to the bill of rights. He also signed a protest respecting an amendment to the bill for recognizing king William and queen Mary. Though lord Delamer was removed from the administration, it was thought necessary to confer on him some mark of royal favour. Accordingly, by letters-patent, bearing date at Westminster, April 17, 1690, he was created earl of Warrington, in the county of Lancaster, to continue to him and the heirs-male of his body. A pension likewise of two thousand pounds per annum was granted to him, for | the better support of that dignity. And it was said, in the preamble of the patent for his earldom, that it was conferred on him, “for his great services in raising and bringing great forces to his majesty, to rescue his country and religion from tyranny and popery.” On the 3d of January, 1692-3, the earl of Warrington signed a protest against the rejection of the bill for incapacitating persons in office under the crown, either civil or military, from sitting in the house of commons. Two other protests were also signed by him on different occasions. But this patriotic peer did not live long to enjoy his new dignity; for he died at London on the 2d of January, 1693-4, having not quite completed the forty-second year of his age. 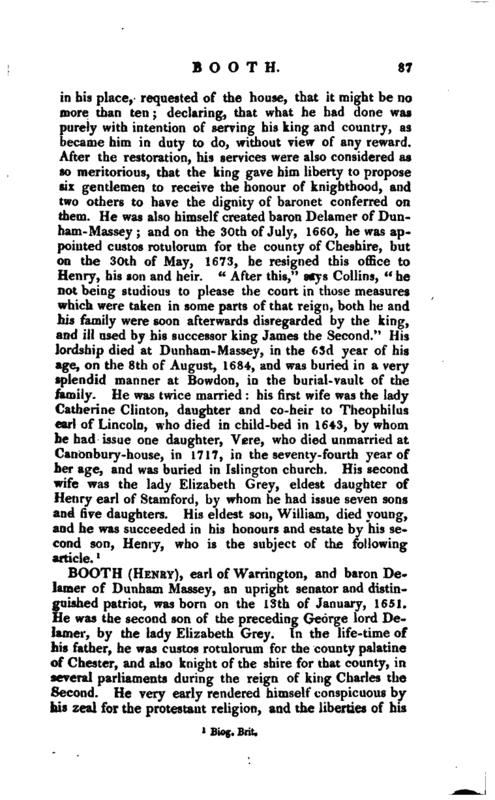 He was interred in the family vault in Bowdon church, in the county of Chester, on the 14th of the same month. Mr. Granger says, that lord Delamer was “a man of a generous and noble nature, which disdained, upon any terms, to submit to servitude; and whose passions seemed to centre in the love of civil and religious liberty.” In every part of his life, indeed, he appears to have been actuated by the same principles; and in his “Advice to his Children,” printed in his works, he says, “There never yet was any good man who had not an ardent zeal for his country.” He was not only illustriously distinguished by his public spirit, and his noble ardour in defence of the liberties of his country; but in his private life he appears to have been a man of strict piety, and of great worth, honour, and humanity. He married Mary, sole daughter and heiress to sir James Langham, of Cottesbrooke, in the county of Northampton, knight and baronet, by whom he had four sons, and two daughters. 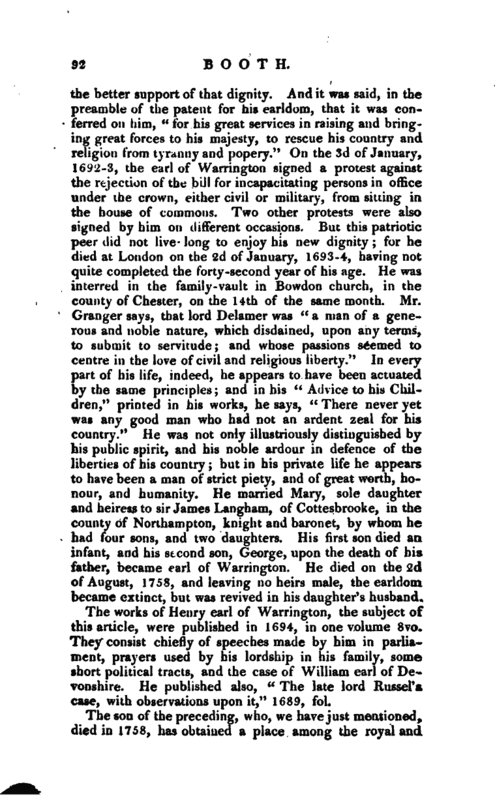 His first son died an infant, and his second son, George, upon the death of his father, became earl of Warrington. He died on the 2d of August, 1758, and leaving no heirs male, the earldom became extinct, but was revived in his daughter’s husband. 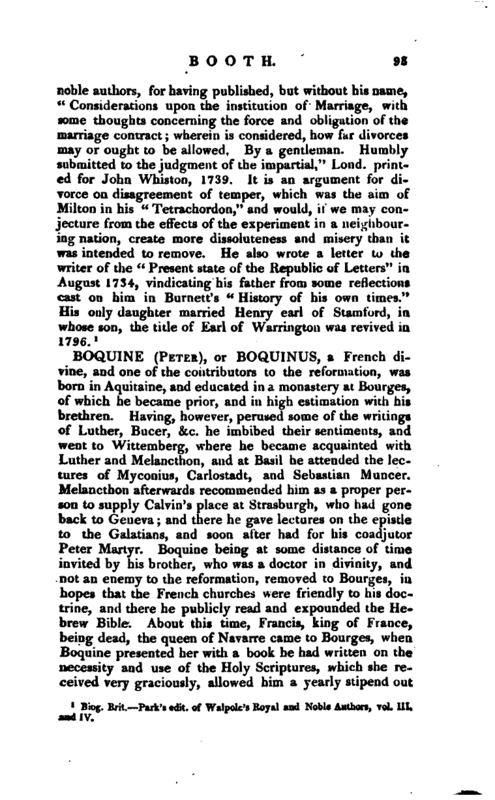 The works of Henry earl of Warrington, the subject of this article, were published in 1694, in one volume 8vo. They consist chiefly of speeches made by him in parliament, prayers used by his lordship in his family, some short political tracts, and the case of William earl of Devonshire. He published also, “The late lord Russel’s case, with observations upon it,” 1689, fol. 1 Biog. Brit. Park’s edit. of Walpole’s Royal and Noble Authors, vol. III. and IV.